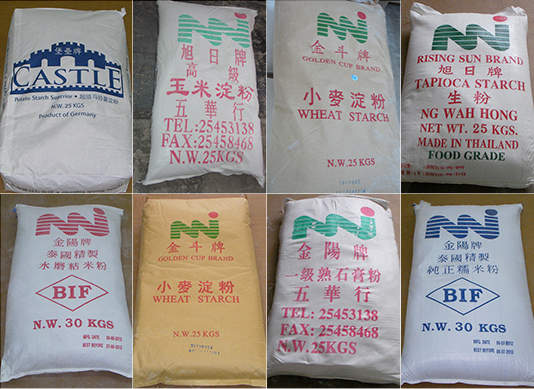 Ng Wah International Development Limited (NWH) is carrying a wide range of food stuff, including: Wheat flour, Corn starch, Potato starch, Wheat starch, Tapioca starch, Rice flour, Glutinous rice flour, Green bean starch and quality shrimp roes and etc. NWH has long been the sole agent and importer of various famous branded products all over the world, including Europe, Australia, Canada, Korea, Thailand, China, and so on. Our company imports, exports, re-export and distribute a great variety of food stuff in Mainland China, Hong Kong and Macau. In addition, our company is also committed to establish our quality house brands, including Rising Sun Brand Rice flour, Rising Sun Corn Starch, Golden Cup Wheat Starch, Castle Brand Potato Starch, Brilliant Sun White Rice Flour and Glutinous Rice Flour and etc., they are all well known by customers. To cater the diverse needs of each noodle factory and food manufacturer, we provide different type of food products accordingly to customer’s requirement.